No, that isn’t the title of some strange book I’ve discovered but rather a description of this week’s reading experience. The Brick is “Sakhalin Island” by Chekhov which I’ve been struggling with over the past several days – it’s a thick volume from Alma Classics which I got with a Waterstones gift card someone kindly gave me (yay!) 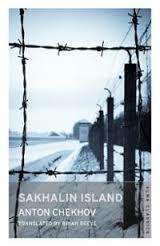 and I confess it’s not been the easiest reading experience…..
Basically, in 1890 Chekhov made a long and difficult journey through Siberia to Sakhalin Island, to inspect the prison settlements there and report on his findings. This was not an official visit, and it’s not really clear what his motivations were in making the visit. Certainly, he had been suffering ill-health and coughing up blood for some years, so it was an arduous journey for someone in that condition to undertake. It may be that he was motivated by humanitarian motives, wanted a dramatic change in his lifestyle or wished to make a change from his usual type of work – I guess we will never know. Anyway, Sakhalin Island itself is a long way away from Chekhov’s home – it’s actually quite a large island just to the north of Japan off the Siberian coast, and had not been a Russian territory for that long. The first part of the book, titled “From Siberia” collects together articles sent back by Chekhov dealing with his journey across the wastes of Siberia, and in some ways these are the most interesting part of the book, being lyrical, descriptive and beautiful in places. Then there is the collection of chapters on Sakhalin itself, 23 in all, plus copious notes and extra material on Chekhov. It’s a loooong book! The conditions Chekhov encountered in the penal settlements were quite appalling, and his reports must have come as quite a revelation to much of Western Russia. He encountered brutality from both prisoners and warders, floggings, dreadful living conditions, starvation, forced prostitution and on and on. Nowadays, from our 21st century view of all the vile happenings of the 20th century, this is not quite so shocking but it is hard to underestimate the effect it would have had at the time, and Chekhov’s book has been credited with changing the penal system. The position of women prisoners and exiles was particularly harsh and he devotes a whole chapter to it. However, I struggled with this book. Not because of the length, I hasten to add, or the subject matter, because I’ve read much worse. The trouble is possibly with me, in that I may have approached it expecting more of a travelogue, which this patently isn’t. The latter half of the book is chapter after chapter of facts and figures – there are moments when Chekhov will relate a specific story of a prisoner and the human element creeps in, but to be honest a simple reeling off of statistics loses the reader and weakens the point the author is trying to make. 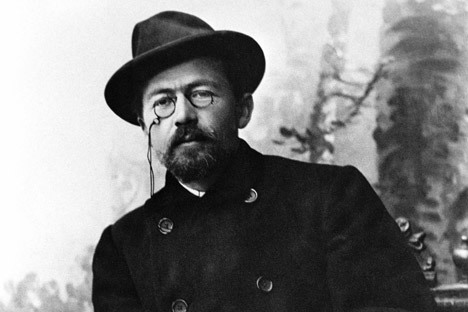 Chekhov is as critical as he can be about the regime, strongly so in many places, but he is always working within the confines of his editors and the authorities. He was shielded from contact with political prisoner although he does drop hints in places about them. Onto the diversion! I was getting so bogged down with Chekhov that I decided I needed a little light relief alongside, so I picked a book off Mount TBR that I’ve been meaning to start for a while: “Twenty Five” by Beverley Nichols, in a lovely old Penguin edition (it was one of the first 10 Penguins issued, though mine is not a first edition, alas!) I first came across Nichols nearly a year ago via the Reading 1900-1950 blog and read his “Crazy Pavements” which I loved. His style is light, witty and very, very readable but often hiding a darker, more serious side. I thought this would be just right to lift my reading state of mind and I was right! “Twenty Five” is Nichols’ autobiography, written when he was – you’ve guessed it! – 25! It might seem rather absurd to write such a thing at such a young age, but in fact Nichols had led quite an eventful life up to that point and has plenty to cover already. Strictly speaking, it’s not really a proper autobiography – more a collection of reminiscences, stories round a dining table, full of name-dropping and lively events. But it’s none the worse for this. Some of the chapter headings might give you an idea of the contents: “Containing a fruitless search for American vulgarity”, “In which we meet a ghost”, “Showing how a genius worshipped devils in the mountains” and “Containing the hideous truth about Noel Coward”. There is shameless name-dropping of royalty (the King and Queen of Greece), politicians (Winston Churchill and President Wilson) and authors (Masefield, Yeats, Bridges, Chesterton, Maugham) – but this never seems gratuitous and Nichols comes across as a fairly modest, very likeable chap! He is, indeed, a great champion of the flippant, stating “If, however, there were a little more flippancy in the world, there might be a few less wars. Swords cannot be unsheathed flippantly. Poison cannot be made with an airy gesture. Notes cannot be flicked across the Channel from one ambassador to another, like blowing kisses. If they could, they might not cause so much trouble.” Which, if you think about it, is quite good advice – if the world lightened up a little, there might be less conflict. There were two parts that stood out for me, too, as a Virago reader. One was a moving little pen portrait of “Lady Russell” the author of “Vera” – known of course to Virago readers as Elizabeth von Arnim. The other was the chapter “Hanged by the Neck”, which covered the Bywaters/Thompson murder trial, the case being the basis for the wonderful book “A Pin to See The Peepshow” by F. Tennyson Jesse. 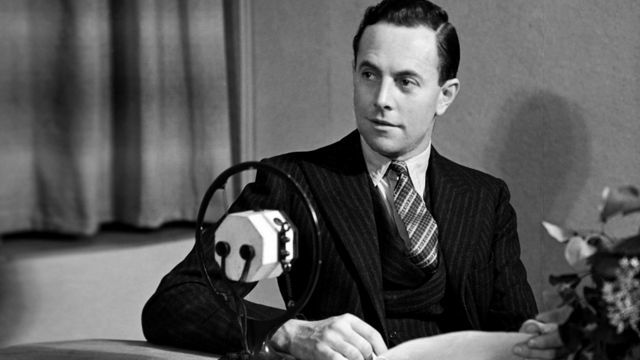 In his role as journalist, Nichols followed the trial and had contact with Thompson’s family and his descriptions of their sufferings are quite heartbreaking. He is not afraid to lay his feelings on the line and this section of the book is particularly moving. So actually, “Twenty-Five” ended up for me being more than just a diversion. It’s a witty, wonderful, clever and surprisingly deep book written by an entertaining and decent human being who has quite a lot to say about the human condition in an oblique way. Highly recommended! I’m trying to imagine how many pages my autobiography would have run to if I had written it at aged 25. Hmmm – maybe a couple of paragraphs?! I like Beverley Nichols’ style, so will keep an eye out for this one. Same here – what an eventful life he led! His style is wonderful, isn’t it? I think I might really like the Beverly Nichols biography one day too, I read a children’s book by him when I was very young (and thought he was a she) and loved it so much that it has stayed with me in part at least, all these years later. It is the only book by him I have read I think. I so wish I still had a copy of The Tree that sat down – it would probably turn out to be pretty terrible I was probably seven or something when I read it. I think you would like it Ali – it’s very witty! I never had any of his children’s books, but they seem to be very collectible. I quite like the idea of some of his gardening books too! Fantastic post, Karen! I was more drawn to the Nichols, perhaps unsurprisingly, and I really MUST read something by him one of these days – I certainly have enough on my shelves, and have so far only read the book he cowrote with Monica Dickens. That description of the play is hilarious! You would *love* Nichols, Simon – you really should read something of his – definitely – soon!! And no, I didn’t know about the Delafield but I shall certainly be tracking that one down – thanks for the hint! I have a gardening book by Nichols which I have yet to read, and I just love the cheerful titles of all his gardening books (Merry Hall, Laughter on the Stairs, Sunlight on The Lawn etc.) This autobiography of his sounds really fascinating, will have to hunt it down as well! It’s a lovely, lovely read and I found myself laughing out loud at several points! I shall definitely be keeping my eyes open for any of his gardening books. If they have stores of old stuff you may be in luck because a lot of his work seems to be hard to come by. I do have his novel Self on Mount TBR too. He’s a very witty read!